Home / / Should I Remove Wallpaper or Paint Over It? Painting over wallpaper, primed wallpaper with shellac primer. When it comes to improving the looks of a room that is already wallpapered, it always comes down to the same question: remove the wallpaper or paint over it? Really, whether you should remove wallpaper or paint over depends on several factors, but the short answer is: remove it if you can. It may seem like a hassle to spend hours tearing down wallpaper. But, painting over wallpaper has its own pitfalls. It also requires a significant amount of prep work to achieve attractive results. In the end, the hassle of removing it is usually worth the effort, because you’ll end up with a more professional finish. There are problems with painting over the wallpaper. The fact of the matter is, more often than not, if you paint over existing wallpaper you are not going to be happy with the outcome. We strongly recommend that unless you have to, because of the wall condition for example, that you do not paint over existing wallpaper. Visible seams – paint is good for adding color, not covering up flaws. Seams are very visible unless you take special precautions. Unwanted texture – almost all wallpaper has some texture. It may not be visible at first- but once you cover it with paint, every little flower and stripe is going to show right through. You’ll need to apply a shellac primer or use oil-based paint. Latex (water-based) paint softens the wallpaper’s adhesive, which can cause bubbles and other nasty effects. Oil based paint and shellac primer have a stronger odor and is more difficult to clean up. Peeling wallpaper will take the paint down with it. Pretty self-explanatory. Finally, if you don’t like how the painted-over wallpaper looks, you’ve just put yourself in a bad spot. Painting over wallpaper stiffens it and makes it harder to remove. Chances are good that you’ll now have to deal with damaged drywall in addition to your other paint prep. If your walls are in good condition; the wallpaper is torn, peeling, or showing other signs of failure; or if the wallpaper has visible texture- grit your teeth and remove it before painting. You’ll be glad you did. Unfortunately, not all walls are in good condition. Sometimes pulling down the paper will pull down the wall, too! 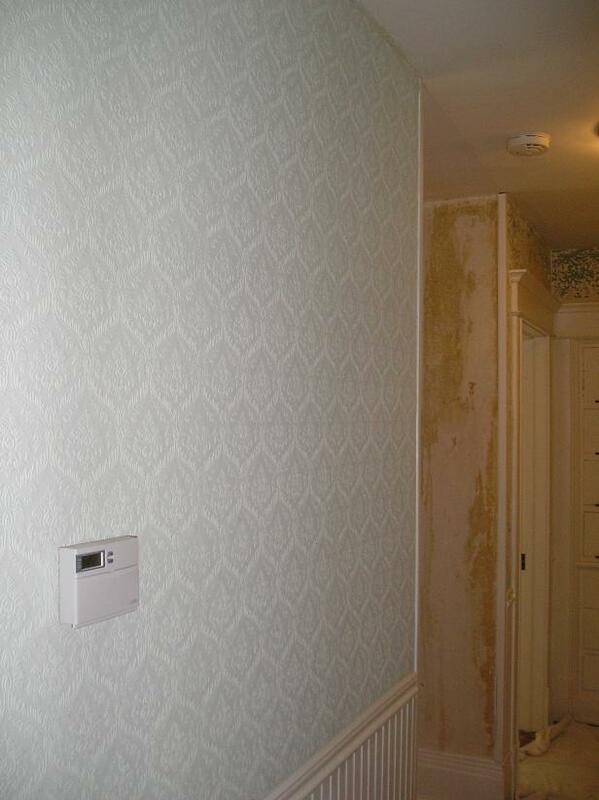 If you have very old or damaged walls- sometimes wallpaper is the only thing keeping ancient plaster from crumbling. If you think that might be the case, and new drywall isn’t in the budget, the only thing you can do is paint over the wallpaper and hope for the best. If the wallpaper has been painted over in the past, especially if it’s been done more than once. Painting wallpaper seals and stiffens it. Because the wallpaper is now much less porous, steam and chemical strippers will have a hard time penetrating. Brute force will probably damage the wall underneath. If you suspect that the wallpaper was pasted directly onto the wallboard with no sealer in between. This practice is fairly common in new constructions and pre-fab homes. Modern adhesives have a lot of staying power. If the wallpaper is in decent shape, pulling it off will damage the wall underneath, sometimes irreparably. Professional results are possible when painting over wallpaper. It just requires significant time and preparation. Don’t skimp on materials, either. Quality products will make a potentially frustrating job much smoother. Once you’ve weighed the options and decided whether you’re going to remove the wallpaper or paint over it, gather up your materials and jump in with enthusiasm! We get asked a lot of these questions above almost weekly. And you touched on several characteristics many wouldn’t know without a ton of experience. I did want to mention a few points concerning the seams and oil based paint that we have found worked for us over the years. Seams: To get rid of any curling or unsightly seams; we cut them out and lightly skim with mud. With primer and a few coats of finish they are locked down and invisible. Primer: Using an odorless oil primer will not lift the paper and allows for latex finish coats on the paper. We’ve had 100% success with this. Once again, thanks for all the great info!